The Intensive Care Unit Support Teams for Ex-Patients (ICUsteps) was founded in 2005 by ex-patients, their relatives and ICU staff to support patients and their families through the long road to recovery from critical illness. Encourage research into treatment and the prevention of these issues. ICUsteps is the United Kingdom's only support group for people who have been affected by critical illness and has helped many former patients, their relatives and medical staff from organisations around the world. 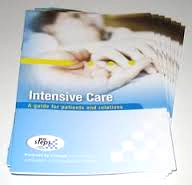 This guide contains advice and information about intensive care. It tells you how critical illness may be treated and what recovery may be like. Not every patient will experience all of these things, but they are more likely to if they have been in intensive care for more than a few days. Most of this guide is written for patients but there is a section specifically for relatives and visitors. By reading the guide, relatives will learn what a patient's recovery may involve and it will give them the answers to some of the questions they may have. Recovery is often a long and slow process. To begin with, patients may not feel up to reading this information, so if you are a relative, please keep hold of this booklet and pass it on when the patient is ready. One of the scariest things about having a critical illness is not knowing what's going to happen. This section covers many of the questions that patients and relatives often have following a critical illness. It tells you what may happen and where you can find out more information. Each section covers a different stage of the process of treatment and recovery. ‘We are both ex-ICU patients (from August and October 2011) and we have found it so very helpful to talk to other people who have had a similar experience to ourselves. Some of you may have found that your life post-ICU bears no resemblance to your life pre-ICU and this takes quite a lot of adjusting to - be it problems at home, work or with relationships and not discounting on-going medical problems. Please do try and come along – for a chat, moan, laugh or cry – whichever you feel like doing on the night – we may not have a solution to any of your problems but we might certainly have a few ideas and can give lots of moral support! (Not forgetting professional experience from staff within this field). We would also like your feedback on anything relating to these drop-ins, as we want them to be as useful as possible, so let us know what you think. Refreshments will be available during the evening and you can stay for as long as you like – be it 5 minutes or the 2 hours. We really look forward to meeting some old friends from physio, and making lots of new friends, so we hope as many of you as possible can “drop-in”.